Kelleher told his wife he was going to help Ask. “Don’t drive,” she told him. So he didn’t. “If I had, I wouldn’t be here today because at the bottom of our road, the hillside had washed away and I’d have driven into 6 feet deep rushing water.” Kelleher survived. Ask didn’t. His trailer was swept away. Kelleher found Ask’s body in a tree. Because Kelleher has a personal connection to the area, and to the victims of the floods, he says he takes it personally when people criticize the state’s response. He’s part of that response. He’s the head of the disaster task force for the state in his position with the Department of Employment and Economic Development. A few times this month, appearing before county commissioners in the region, he’s expressed frustration with negative media reports about people not getting flood relief. In at least one front-page case, he says, the couple didn’t apply for assistance. Kelleher says he knows some people — especially older residents — in small towns don’t want to ask for help, but he says the help is available. But time is running out. The deadline for applying has been extended from January to March 15. The system in place requires that the state assistance for homeowners follows the denials of federal aid. Businesses, however, are able to get the state aid first, and he figures some of the homeowners’ frustration comes from seeing businesses getting help first. 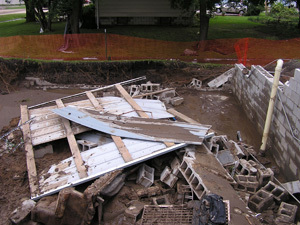 “The federal people have said that in many disasters in other states, there is no state aid to fall back on,” he says, noting that flood dollars had moved into the region faster than ever before in Minnesota. ‹ Older A reward? For what?